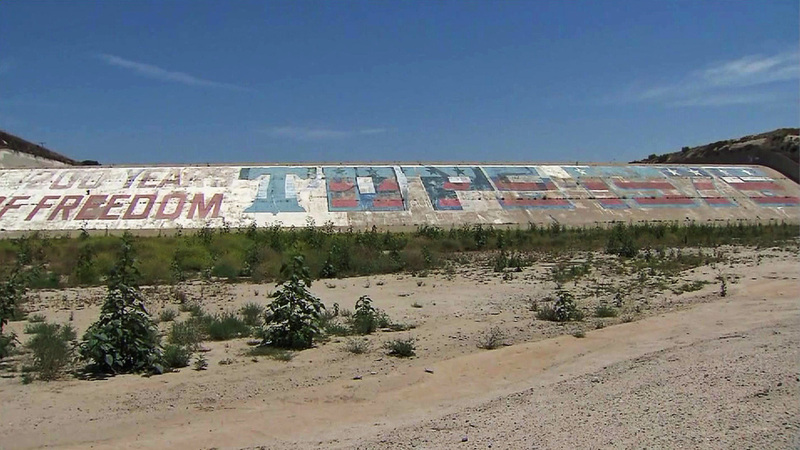 A now-faded and defaced bicentennial mural painted on the Prado Dam spillway in Corona, California. The National Historic Preservation Act has come to the rescue of this mural from 1976, which is badly in need of conservation. But in the process a federal court has muddled the Moral Rights of Artists moving forward. The mural on the Prado Dam near Corona, California was painted by High School students from Corona High School. The Army Corps of Engineers, which manages the dam and spillway planned to remove the mural over concerns of lead paint, tagged graffiti artists who replaced the 1776 with “TOPS”. Carolina Miranda reported for the L.A. Times in June that the image “has become one of the region’s more iconic, unofficial freeway landmarks”. Two groups sought protection in Federal Court for the mural, both the Mural Conservancy of Los Angeles, and one of the original artists and designers of the mural, Ronald Kammeyer. The mural predates the effective date of VARA, obviously. So the plaintiffs—if they are the “Author”—could only assert VARA rights if they had not transferred title to the physical work (not the copyright, which one or more of them undoubtedly still holds). But none of the plaintiffs claimed to own the mural, either when it was painted or now. Someone, possibly Kammeyer alone, possibly Kammeyer jointly with the volunteers who helped him, owns the copyright. That will endure either alone or as joint work, under the term of copyright. But could any of them claim to have owned title to the physical work in 1976? On a federally-owned flood management dam? It seems a stretch. The opinion misses this threshold question entirely. Second, VARA is absolutely a “lifelong” veto when it applies. That is exactly what it is supposed to endow on the artist. Good writing matters, both in drafting judicial opinions and also in drafting legislation. The Court and attorneys could be given at least a little reprieve from us as the act it self is terribly arcane. Congress did us no favors when drafting this piece of legislation. I have to agree with O’Donnell—when there are so few judicial opinions in the United States which take up the moral rights of artists, to miss so badly on some key provisions is a missed opportunity. The Court ultimately upheld the injunction on the basis of the National Historic Preservation Act as the Army Corps of Engineers failed to comply with that act’s “stop, look, and listen provision” which requires federal agencies to “make a reasonable and good faith effort to identify historic properties”. But not before muddling the slowly diminishing respect for the moral rights of artists under VARA. Kammeyer v. Oneida Total Integrated Enterprises, No. EDCV15869JGBKKX, 2015 WL 5031959 (C.D. Cal. Aug. 24, 2015). Nicholas O’Donnell, New VARA Ruling Muddies Analysis on Moral Rights and Significance of “Site Specific” Art Art Law Report (2015), http://www.artlawreport.com/2015/11/12/new-vara-ruling-muddies-analysis-on-moral-rights-and-significance-of-site-specific-art/. Carolina A. Miranda, Court order halts destruction of Prado Dam bicentennial mural in Corona latimes.com (2015), http://www.latimes.com/entertainment/arts/miranda/la-et-cam-restraining-order-temporarily-halts-destruction-of-40-year-old-mural-on-prado-dam-20150609-column.html .